I love summer, but for some reason lately I can't wait for fall to get here. Perhaps it's because I'm looking forward to more put together outfits and layering, instead of my summer uniform of shorts and summer dresses. On my list to buy is a pair of green plaid pants that I spotted in a look book from LOFT (perhaps putting together a look like this). 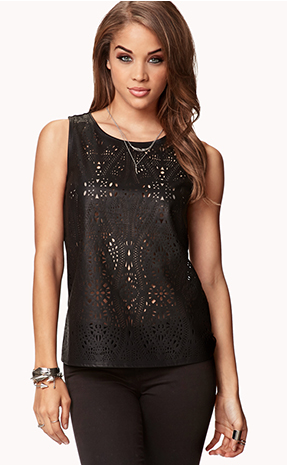 And this faux leather cut-out top from Forever 21. Although this look could easily work now for the summer (leather has been huge for the summer) I usually like to wear bright colors in the summer and keep my darker colors for the fall and winter months.